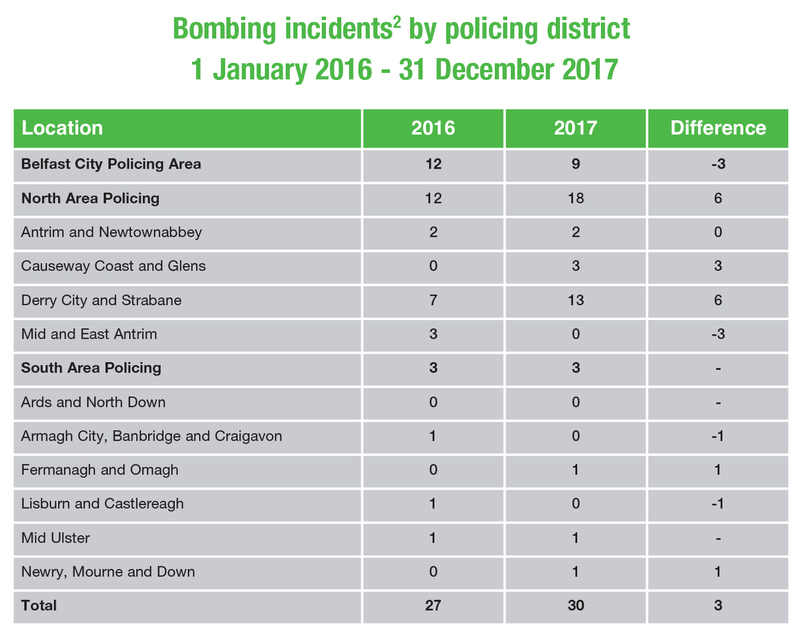 The latest police recorded security situation statistics for Northern Ireland, covering the period from 1 January 2017 until 31 December 2017 indicate that “a significant threat still remains”. 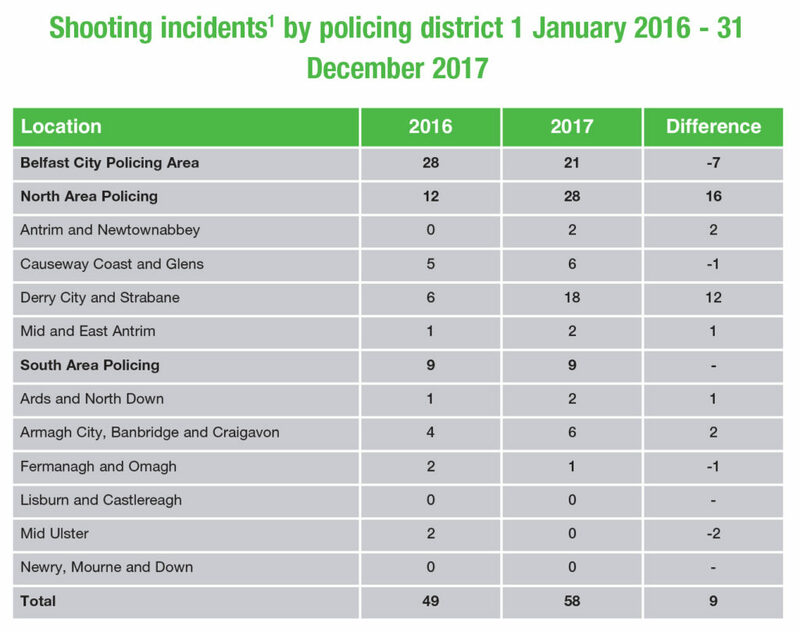 Figures from the PSNI’s Statistics Branch record that there were nine additional shooting incidents in 2017 (58) when compared with 2016 (49) and a slight increase in bombing incidents (excluding those involving hoax device, petrol bombing and incendiaries), up to 30 from a figure of 27 which had represented a low point for the decade following 2007. Incendiary devices have not been used since 2014 and only intermittently since 1998, the peak having been reached in 2004. On average, since 1998, there have been 128 shootings and 79 bombing incidents per annum meaning that the trends for 2017 actually reflect a substantial reduction. Indeed, the last decade, from 1 January 2008 to 31 December 2017 indicate a reduced average trend of 61 shootings and 50 bombing incidents per annum. Overall, there were 2,416 shooting and 1,502 bombing incidents between 01 January 1999 and 31 December 2017. Mirroring a trend since 2007, the figures for 2017 indicate that republican paramilitaries were more likely to carry out paramilitary style shootings than loyalists, who were more likely to engage in paramilitary style assaults. These figures do not incorporate deaths which occur as a result of paramilitary style shootings/assaults and attribution is based upon information available to the PSNI, though it does not necessarily suggest the involvement of a paramilitary organisation. In 2017, a total of 27 individuals were victims of paramilitary style shootings, the clear majority of which were attributed to republicans (89 per cent) with loyalists responsible for only three of such shootings. However, the PSNI attributes 77 per cent (57) of a total of 74 paramilitary style assaults to loyalists. Republicans carried out the remaining 17 assaults, resulting in a combined total of 101 paramilitary style shootings and assaults for the year. There were two security related deaths in 2017, one in Mid and East Antrim and the other in Ards and North Down policing districts. This is a reduction on the six security related deaths which occurred in 2016 (the largest number since 2003). Police figures indicate that 106 security related deaths have occurred since 1998, the vast majority of which were civilians (over 96 per cent), alongside two police officers and two soldiers. There has not been a single year without a security related death, though 2008, 2011 and 2013 came closest with only one death occurring in each. The figures for the number of firearms and the weight of explosives seized by the PSNI in 2017 were the lowest since 1998. On average, in 2017, three firearms were recovered each month, with a total of 40 seized over the course of the year, alongside 4,262 rounds of ammunition and 0.39 kg of explosives. This contrasts with an average of 82 firearms and 21.48 kg of explosives being seized per annum over the last decade. In total, 819 firearms and 214.77 kg of explosives were seized by the PSNI between January 2008 and December 2017. At the same time, while the number of people being arrested under the Section 41 of the Terrorism Act (2000) increased by 41 per cent (50 arrests) between 2016 and 2017, there were 28 per cent (five) less persons subsequently charged. Indeed, 2017 marked a 10-year low for the number of people subsequently charged after a S41 arrest with only 13 charges. The average for the decade, from 1 January 2008 to 31 December 2017, is 170 S41 arrests and 33 subsequent charges per annum. With regards to security related incidents, the PSNI’s figures come with a caveat that they do not include incidents recorded in either the Republic of Ireland or Great Britain. At the same time, they only include incidents that have been reported to police and as such, a degree of under reporting may exist. The trends for the last decade indicate a comparatively low though consistent frequency of security related incidents However, it is this consistency which suggests a continued trend of security related incidents into the foreseeable future. The current security status is somewhat comparable with former British Home Secretary Reginald Maulding’s “acceptable level of violence” phrase, first coined in 1971. It seems likely that the security situation is being directed by a policy of containment to ensure that incident frequency does not exceed particular parameters. In other words, a managed decline aimed at the end goal of an ultimate cessation. 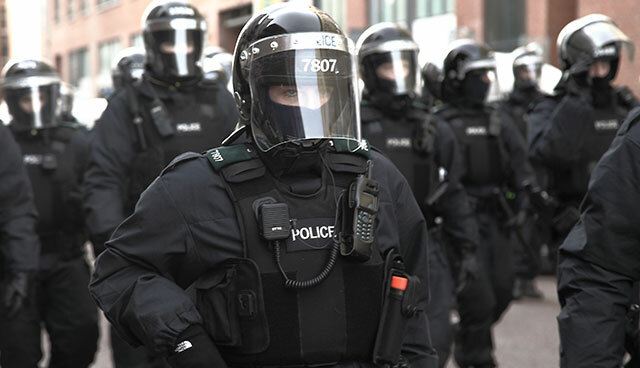 As such, while at a relatively lower ebb, it is apparent that paramilitary capability and propensity to exhibit violence remains a threat to the security situation in Northern Ireland. 1. Incidents include shots fired by paramilitaries or security forces, paramilitary style shootings and shots heard and later confirmed. 2. Incidents may involve one or more explosive devices and incorporate figures for explosions and defusions. The figures exclude hoax devices, petrol bombings and incendiaries.